A surfer has been filmed disturbing a colony of sea lions a day after a tourist was nearly mauled by the giant mammals. The long-haired man, carrying a white surfboard, was caught throwing objects and running towards three sleeping beasts at Allans Beach in Dunedin, New Zealand. ‘I wish he’d trip on his bloody face,’ the camerawoman is heard saying as the surfer runs away from an agitated sea lion. 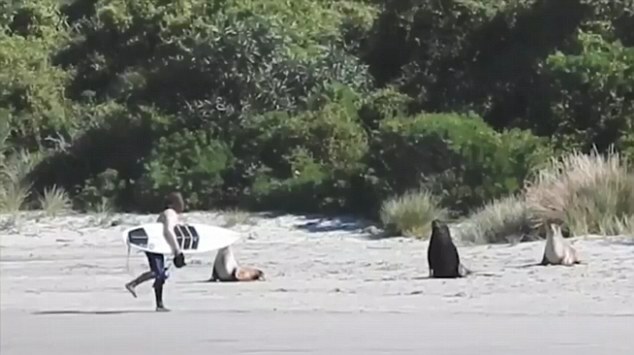 The New Zealand Sea Lion Trust volunteer, who filmed the incident and wanted to remain anonymous, hopes the surfer will be punished for provoking the marine animals. The less-than-smart incident has emerged a day after a tourist was nearly mauled for dancing next to a group of sea lions at Sandfly Bay, located in the same city. The Department of Conservation (DoC) said people needed to exist in harmony with the sea lions and would not close any beaches where the sea creatures were active. The DoC recommends people to stay 10 metres away from the sea lions when they are sleeping, and 20 metres away when they are awake. 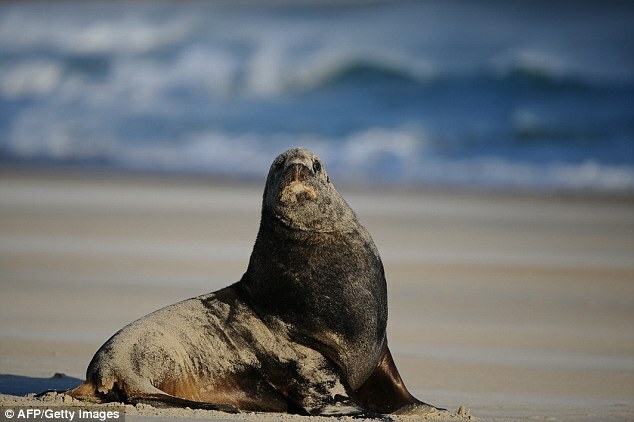 The DoC also advises to avoid touching sea lions as it makes the marine animals aggressive and pass on diseases.